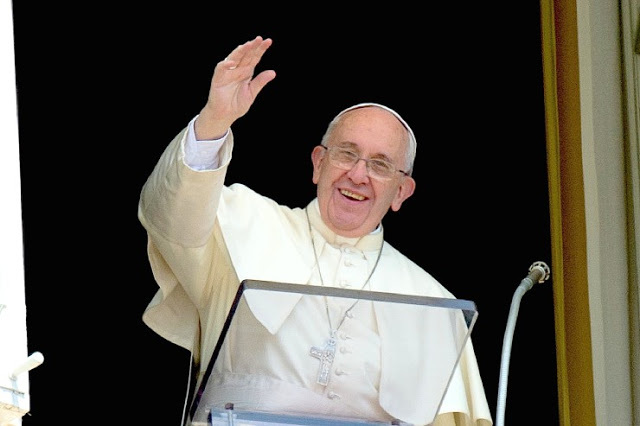 Catholic News World : Pope Francis at Angelus "On this third Sunday of Advent the liturgy invites us to Joy." Pope Francis at Angelus "On this third Sunday of Advent the liturgy invites us to Joy." On this third Sunday of Advent the liturgy invites us to joy. Feel good: to joy. With these words the Prophet Zephania addresses the small portion of the people of Israel: "Rejoice, daughter of Zion, cry out for joy, Israel, rejoice and proclaim with all your heart, daughter of Jerusalem!" (3:14). Shout with joy, rejoice, rejoice: this is the invitation of this Sunday. The inhabitants of the holy city are called to rejoice because the Lord has revoked his condemnation (see verse 15). God has forgiven, he did not want to punish! As a consequence there is no longer any reason for sadness for the people, there is no longer any reason for discouragement, but everything leads to a joyful gratitude to God, who always wants to redeem and save those he loves. And the love of the Lord for his people is incessant, comparable to the tenderness of the father for the children, of the bridegroom for the bride, as Zephania says: "He will rejoice for you, he will renew you with his love, he will exult for you with shouts of joy "(v. 17). This is - so it is called - the Sunday of joy: the third Sunday of Advent, before Christmas. This appeal of the prophet is especially appropriate in the time we prepare for Christmas, because it applies to Jesus, Emmanuel, God-with-us: his presence is the source of joy. In fact, Zephania proclaims: "The king of Israel is the Lord among you"; and a little later he repeats: "The Lord your God is a mighty savior among you" (verses 15.17). This message finds its full meaning in the moment of the Annunciation to Mary, narrated by the evangelist Luke. The words addressed by the angel Gabriel to the Virgin are like an echo of those of the prophet. What does the archangel Gabriel say? "Rejoice, full of grace, the Lord is with you" (Lk 1:28). "Rejoice", he tells the Madonna. In a remote village in Galilee, in the heart of a young woman unknown to the world, God ignites the spark of happiness for the whole world. And today the same proclamation is addressed to the Church, called to welcome the Gospel so that it may become flesh, concrete life. He says to the Church, to all of us: "Rejoice, small Christian community, poor and humble but beautiful in my eyes because you ardently desire my Kingdom, you are hungry and thirsty for justice, patiently weave plots of peace, do not pursue the powerful on duty but stay faithfully next to the poor. And so you are not afraid of anything but your heart is in joy ". If we live like this, in the presence of the Lord, our heart will always be in joy. The "high level" joy, when there is full, and the humble joy of every day, that is peace. Peace is the smallest joy, but it is joy. Today, too, St. Paul urges us not to worry about it, not to despair at all, but in all circumstances to make God present our requests, our needs, our concerns "with prayers and petitions" (Phil 4,6). The awareness that in difficulties we can always turn to the Lord, and that He never rejects our invocations, is a great reason for joy. No worry, no fear will ever take away the serenity that comes not from human things, from human consolations, no, the serenity that comes from God, from knowing that God lovingly guides our lives, and always does. Even in the midst of problems and sufferings, this certainty nourishes hope and courage. But to welcome the Lord's invitation to joy, we need to be people willing to question ourselves. What does this mean? Just like those who, after having listened to the preaching of John the Baptist, ask him: you preach like this, and we, "what shall we do?" (Lk 3, 10) What should I do? the conversion we are invited to make in this time of Advent.Everyone of us is asked: what should I do? A small thing, but "what should I do?" And the Virgin Mary, who is our mother, help us to open the our heart to the God who comes, because He floods our whole life with joy. Last week the World Pact for a Safe, Ordinary and Regular Migration was approved in Marrakech, Morocco, which intends to be a framework for the whole international community. I therefore hope that, thanks also to this instrument, it can work with responsibility, solidarity and compassion towards those who, for various reasons, have left their country, and I entrust this intention to your prayers. I greet all of you, families, parish groups and associations, who have come from Rome, Italy and many parts of the world. In particular I greet the pilgrims from Seville, Hamburg, Munich and Chapelle, in Belgium. I greet the faithful of Pescara, Potenza, Bucchianico, Fabriano and Blera; the Comboni Lay Missionaries; and the Scouts of Jesolo and Ca 'Savio. And now I address myself especially to you, dear children of Rome, who have come for the blessing of the "little children", accompanied by the Auxiliary Bishop Monsignor Ruzza. I thank the Roman Oratori Center and the volunteers. Dear children, when, in your homes, you will gather in prayer in front of the nativity scene, fixing your gaze on the Child Jesus you will feel the astonishment ... You ask me: what does "amazement" mean? It is a stronger feeling, it is more than a common emotion. It is to see God: the wonder for the great mystery of God made man; and the Holy Spirit will put you in the heart the humility, the tenderness and the goodness of Jesus. Jesus is good, Jesus is tender, Jesus is humble. This is the real Christmas! Do not forget. That's the same for you and your family members. I bless all the "Bambinelli". I wish everyone a good Sunday and a good third week of Advent. With joy, so much joy, and so much peace when joy is not possible. And please, do not forget to pray for me. Good lunch and goodbye.